1. A rocker switch that comes with a hooded steel activator plate. The welded steel protective hood, gives the saber a unique look, while also helping to protect the activator during use. This type of switch can only be used in LED only sabers because it sits down into the hilt. 2. A slide switch that comes with an ergonomically cut steel bar activator plate. The switch sits inside the bar leafs where it is protected from accidental shut off or damage during use. The button is capped with metal to further protect the switch. This type of switch must be used on customized Hasbro FX Lightsabers, due to the way the electronics fit inside the hilt. 3. An Internal Switch that is located inside the center section of the Light Up Saber hilt. The activator plate has a hole in it, allowing you to activate the saber with your thumb and then grasp the hilt without accidentally bumping or moving the switch. The switch is completely protected by the hilt, and leaves the Light Up Saber body free from an activator protrusion. This type of activator is only used on LED only sabers due to its length inside the hilt. The steel blade socket is approximately 3” deep, giving the blade excellent seating into the hilt. To keep the removable blade in place, a setscrew is used, located near the end of the emitter. The blade setscrew is a heavy gauge, steel alloy screw that has been hand cut, and capped with a knurled, brass or chromed brass knob. The setscrew keeps the blade securely in place by firmly pressing down upon the polycarbonate blade. Every other saber maker out there uses a small gauge, headless, socket screw for blade retention. This means you must use a wrench, always. I developed my thumb screws so that you can easily just use your hand to lock and unlock your blade for very light use. So, when you’re at a Con, and you need to put the blade in for photographs, you can do so quickly and easily. But when you want to swing the saber around or use it to play with, a small pair of pliers is needed to add an extra turn to the set screw, and the blade is then fully locked in place. A set screw like mine makes things easier and gives you more options than anything else out there. 1. Steel, chrome plated D-ring. In my experience, the D-ring tends to be the most secure way to keep a saber connected on a costume belt, however it also allows the saber to swing on the belt. The D-ring also lays lower and flatter on a hilt body, making it more comfortable on the hands when dueling. A D-ring can be placed either on the hilt body, or on the end of the pommel. A Covertec knob must be attached to the hilt body, unless the pommel is long enough to accommodate the knob. The Luxeon LEDs are extremely bright. When the blade is not installed in your hilt, the blade socket is exposed, which means there’s a 4″ deep, 1″ diameter hole in the front of the saber with the LED at its base. This can really take away from the realism and beauty of the saber, plus if you turn on the hilt, the light will shine out like a flashlight. The crystal insert is a great way to make your saber look finished, and keep the LED light from ever shining accidentally into someone’s eyes. It also gives the blade retention screw something to lock down onto, so when you’re hanging it on your belt, you don’t run the risk of the screw walking loose and falling out of the saber. Plus, it looks extremely cool. When the saber is turned on, the crystal lights up. The crystals are made from acrylic, and are shaped by hand. You can either get one that matches the color of the LED in your saber, or get one in clear. AA or AAA alkaline batteries run these sabers. Most use three AAA alkaline batteries. In order to get the most lumens out our LEDs, I drive them to their voltage limit. Using three standard alkaline AAAs is recommended. Rechargeable and Lithium batteries can blow out the LED, so we do not recommend their use. The battery pack is located inside the rear grip and is accessible by removing the threaded steel pommel. The three cell battery packs are hardwired to the saber electronics. The Customized FX Lightsabers are modified so that they can handle full contact use. This means the battery pack / speaker unit is hardwired to the sound board. The pack now is connected to the hilt by wires. My blades have been in use since early 2003, when Advanced Light began the movement to use 1” diameter thick-walled polycarbonate as blade material. Before this, saber blades were ¾” flexible polycarbonate tubes with EL wire running up the inside of the blade. I tested a variety of polycarbonate tubing and used the strongest one for my blades. Advanced Light blades are 1″ in outer diameter, with a heavy wall thickness. The blade film has great light diffusion. And my tips are specifically designed to not break off or crack. The tips are flat, rather than rounded, which helps keep them in place, no matter how hard you beat up the blades. I do not use adhesives to keep them attached, because many types of glue will degrade the strength of the polycarbonate, and can cause eventual cracks. I use this combination for all my saber blades. You won’t need to upgrade from lower quality plastic, because every LED Combat Saber, Duelist Saber, and Custom FX Lightsaber comes with a removable extremely durable blade. Standard single bladed hilts come with a 32” overall length blade. 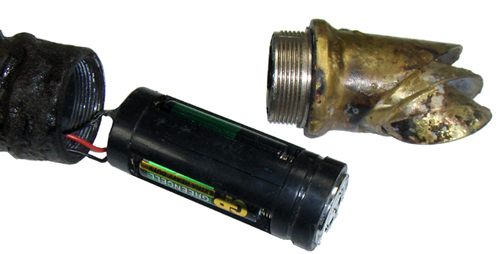 They end up measuring approximately 29″ out of the emitter. And the extra weight of the thick-walled blades when combined with my steel hilts makes your saber feel, balance, and fight like an all steel katana or broadsword. Double-ended sabers come with 24” long blades however custom lengths can be cut to order. Light-Broadswords come with special blades that are usually 40” long out of the emitter. The diffusion core is also made from polycarbonate, which adds enough extra weight to perfectly balance the long steel hilt and cross guard. Light-Rapiers use a flexible, lightweight ¾” polycarbonate blade to mimic its all steel counterpart. Blade color is determined by the color of the LED housed inside the hilt. I use high-powered Luxeon Rebel LEDs in my sabers. 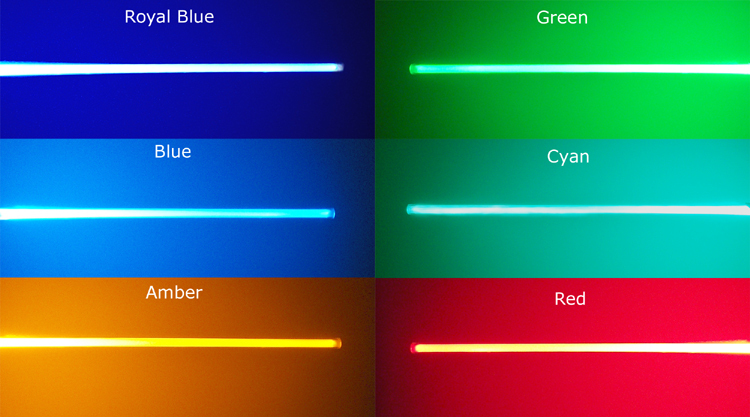 I offer six standard LED colors to choose from. I can also customize blade colors using special filters if you are looking for something different.